After Red Bull Battle Grounds I felt it was appropriate to put up a power ranking. This is MY OWN opinion feel free to share your thoughts/your ownlist though. He won WCS Global Finals and took 2nd place at Red Bull BattleGrounds his style is not solid like his counter-part Dear's style who may be more solid but results talk and ultimately he is the the best player despite losing to a reinvigorated PartinG. 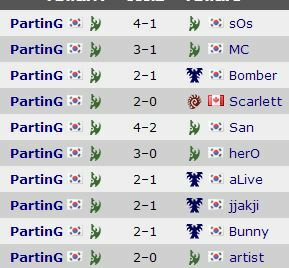 Everything about Jaedong is strong except for the fact that he can't push himself past a 2nd place finish, regardless he is one of the very best in the world right now. The Dong himself no question is one of the very best and he has shown it, though we one day hope he will ascend to the Golden Dong, we have faith. INnoVation might be a controversial choice for some however it's not like he's been doing terrible it's just he hasn't been winning everything, despite his "drop" in results he put up an incredible 12-2 record in the GSTL, the best record in the league, performing clutch games to win Ax-Acer the teamleague. Dear has shown how good he is, now he just needs to keep up his results and he can only go higher in the rankings, the 2nd best protoss player. TaeJa has proved he can match up against the best in the world, he may not be the most consistent at beating them but he shows he can beat them at any time, he is also a foreign tournament destroyer. He has a very high level of skill. Soulkey was a very consistent player in terms of skills & results throughout the year, near the end of 2013 though his results have dropped off slightly still making him a top 3 zerg however, personally I like watching Soulkey's play and I expect to see him winning many a tournament in the future. The king of inconsistency himself.... BOMBER!! Anyways Bomber has did quite well the Global Finals his skill level is very good, however Bomber has a weakness but that doesn't prevent him from being a great player, it prevents him from being TheBest. Full time player, full time student Polt ranks in at #5, he posts results everywhere while still studying full time a truly amazing player, the sad thing is his results will not be consistent to do how is schooling goes, he could have exams to study for a week and drop out of a tournament or he could have minimal school and go onto win the tournament like he did with WCS AM S3. Good Ol' PartinG after a great tournament in winning Red Bull Battlegrounds defeating the likes of the 2013 WCS Global Champion sOs & his rival MC. He has come back after a stint and lack of results in 2013 what I mean by lack of results is that winning red bull is his first big premier tournament victory this year, he's won two other smaller events in Stars War League Season 3 where he 4-0ed HerO & won a stacked little tournament called The Korean WCG Qualifier, overall PartinG has slowly been climbing the ranks where he will go back to the throne of "Protoss King". Not perfect but I think this list is a good representation of the Top 10. This is mostly based off the recent 2 or so months of games.
" Perhaps it's impossible to wear an identity without becoming what you pretend to be. " Switching Dear with Innovation is fair actually I wanted do this but i messed up, i disagree with putting taeja above innovation though. My main problem with this list is that Jaedong is not #1. I mean if he keeps up how he's been playing, idk maybe i worded/described that badly lol. Thanks for posting your input! innovation overrated, supernova handed him the GSTL on a silver platter. Agreed with most of the comments, Dear should be at least top 3 based on results with JD + sOs. Dat Maru bias! Agree otherwise. wait, are you agreeing with his "no" or countering it? Dear, Jaedong, Maru, sOs, Innovation, Soulkey, Parting, Polt, Taeja. sOs hasn't won anything recently but Blizzcon, and it was not in very impressive fashion. Dear has won two tournaments back to back, and still looks super scary even though he lost to Jaedong. Jaedong is super super consistent, the second place on this list suits him. Maru third... He has amazing mechanics, he won a GSL, lately his starsense or choices in his games haven't been completely flawless like before, and so he drops to third. sOs fourth still seems too high, because the guy hasn't done anything like I said before... But I guess he did well at Redbull - the fact he almost lost to Scarlett though only makes me want to put him lower on the list. Innovation lost to duckdeok and has generally been performing poorly lately so i'm not sure why are you putting him ahead of Dear. Soulkey is too low imo , i would put him higher since he's been the most consistent player throughout entire 2013 placing high in gsl so many times. sOs first? As a big of a fanboy of sOs as i am i cant agree there. RedBull battlegrounds is an 8 player tourney and we saw a big hole in sOs' PvP that could've stopped him on his way to WCS Championship if he faced Dear for instance, instead of jaedong. So no way would i give sOs rank 1. It is indeed funny that Jaedong is number tow here as well, although I can't disagree. Who would you put at rank 1 then? Jaedong?